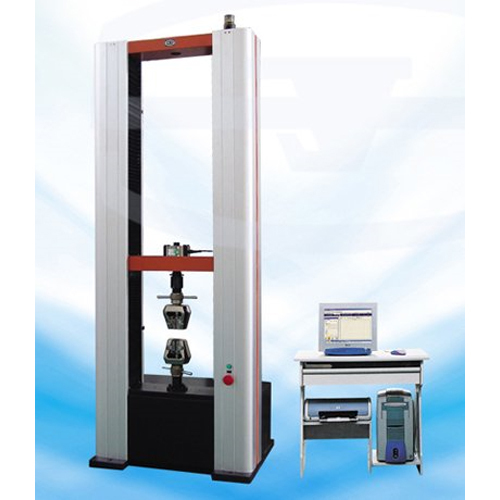 The machine adopt single space door type structure, all tension, compression and bending test are applied at the lower space. The loadframe is consisted of two-column, ballscrew, upper crosshead, middle crosshead and worktable, and the adjustable speed system is installed underside of the worktable. 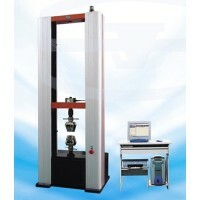 High accuracy, wide range and stable Japan Panasonic AC servo motor drive the ballscrew pair rotating through syn-deceleration system, the ballscrew pair drive middle crosshead, make the tension clamp(compression, bending) move up and down, then realize load and offload to the specimen. This structure has enough stiffness to apply high efficiency and stable moving. Key parts are processed on the processing center to ensure the accuracy of the load frame. Ballscrew is E5 class.